I get the best dinner ideas when I don’t have the ability to write them down. Like sitting at dinner with a fork in my hand. Or pushing The Little through HEB in one of those soul-killing plastic car-cart monstrosities. Then 2 nights later, I’m looking at a random collection of ingredients trying to remember what I was supposed to do with them. That’s why I found myself heavy a pound of white fish and a single orange last week. Since they’re usually for margaritas, I never just buy one orange. It had to be one of those “all I need is X and Y because I have everything else” ideas. Instead, I whipped up a quick margarita-esque marinade, let the fish sit a bit, and then reduced the marinade down to a boozy, citrusy glaze while the fish cooked and I finished the rest of dinner. Drizzled over the fish tacos before serving, the glaze really adds a bright punch of flavor to the tacos. So let this be a lesson: When in Doubt, Margarita. 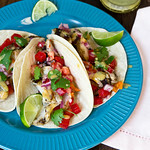 Smokey, grilled fish tacos get a summery, flavorful punch from a margarita glaze. Add the tequila, lime juice, zest, orange juice, and fish to a large zip-top bag and let sit for no longer than 30 minutes (less if your fish is delicate; tilapia and cod tend to hold up well). Stir together the ingredients for the pico de gallo and set aside. Grill the fish 4-5 minutes each side, until the center is just opaque. While the fish is grilling, pour the marinade into a large sauce pan over high heat and bring to a boil, reducing to ~1/4 cup. Serve the fish on tortillas topped with pico de gallo and a drizzle of the tequila reduction. Fish tacos are my thing. If they’re on a menu, I order them. I really need to make these at home…they look phenomenal! 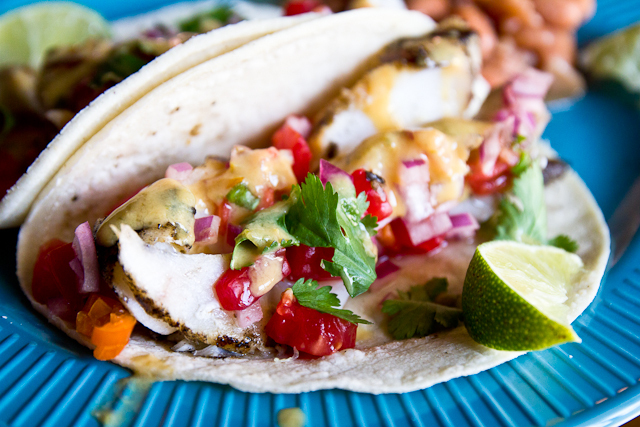 Now these are some seriously gorgeous fish tacos! Absolutely gorgeous. You can’t beat homemade Pico de Gallo and the margarita glaze sounds wonderful, too. Now I just have to go get some fish. And tequila. And an orange, LOL. Well whatever idea you had couldn’t possibly be as delicious as this! And I love your motto. It’s a good one. I SO have those moments where I look in my fridge and have no idea what I intended to do with all those random ingredients. Of course, I strongly suspect that you created something even more fantastic than originally planned with these beauties. I definitely have those moments of letting too much air out of the fridge while I try to figure out what those random ingredients were for. And it’s amazing what some improvising can do! I need these fish tacos in my life…like tonight! This recipe is so awesome I just had to pin it on Pinterest. I hope you don’t mind. I can’t get out of HEB with any less than 12,934 pounds of fresh fruit. Mostly limes. Mostly for margaritas. But now I have another way to put them to good use! These tacos look tasty-licious! oohhh candy crush! so addictive 🙂 i bet these tacos are too! yum. Oh man – candy crush. I’m trying really hard not to get sucked into that. And dude – these tacos are gorgeous. And that boozy citrusy glaze sounds to die for. Oh la la! Looks amazing! Love this idea! I’ve never made fish tacos, but I’ve been meaning to! We’re having this for dinner tonight, and I’m SO excited about it! Would halibut work okay in this?